4 Bedroom Detached House For Sale in Penzance for Guide Price £600,000. Grade II listed converted former watermill set within large secluded, tranquil tropical gardens approaching 1/3 of an acre. The property was converted into a residential dwelling in 1998. Now substantially refurbished it retains many of the original mill workings which create a particularly unusual feature. A fascinating room is the impressive first floor reception room with high vaulted ceilings and exposed mill workings. This room also features polished timber flooring and a recently installed wood burning stove. 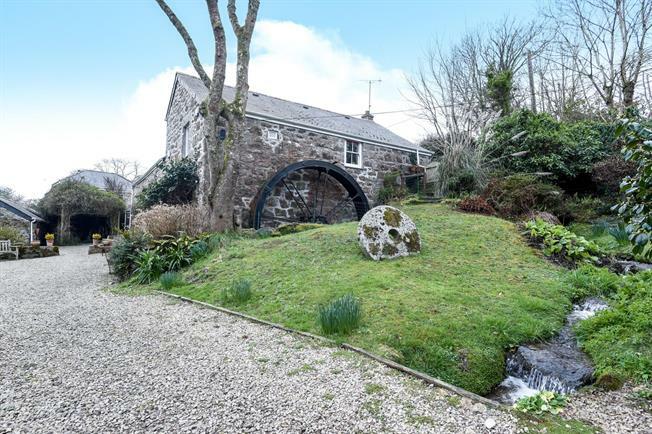 On the ground floor is the impressive fully fitted kitchen/breakfast room also with polished timber flooring and incorporating the main original mill workings. Off the kitchen is a fully fitted cloakroom and door into the formal dining room with inglenook fireplace. Beyond the dining room is an enclosed dressing room of generous proportions leading to the ground floor bedroom four. This gives the opportunity to create a ground floor self contained area if combined with the study and utility room.The study is located off the dining room and next to the utility room from which a stable door provides access to the rear courtyard. At first floor level is the larger en-suite bedroom together with two further bedrooms and a separate family bathroom. The gardens are the major feature of Clapper Mill. They are stocked with a wonderful selection of unusual plants and shrubs which are surrounded by lawns. There is a 50 yard driveway lined with Palm trees leading to the front to the property which is bordered on one side by the mill stream. Lamorna is a very picturesque sheltered valley leading down to the beautiful Lamorna Cove being approximately 1 mile away with the harbour and the popular Lamorna Wink public inn together with a range of services and facilities on the quayside. There are various artist shops and studios in the area. Further facilities are available at St. Buryan, 2 miles, inc a village shop, pub, Post Office etc and at the thriving harbour town of Newlyn with pubs and restaurants, Post Office, shops, fish mongers etc. The famous Newlyn Fish Festival is held on August Bank Holiday and is one of the largest fish and food festivals in the country attracting thousands of visitors each year. The larger fishing port and harbour town of Penzance is about 4 miles distant providing a range of services and amenities inc. hospital, supermarkets, schools, mainline railway line to London Paddington and ferry service to the Isles of Scilly. Mains electricity and mains water, private drainage and telephone line. Fibre optic super fast broadband available. Combination oil fired boiler providing both the hot water and central heating via radiators on both ground and first floor levels. From Penzance head along the promenade towards Newlyn. As you go over the small bridge at Newlyn continue straight on up Chywoone Hill. Continue along this road through the village of Sheffield and continue for approximately a mile and a half passing Lamorna Pottery and at the next right hand bend the entrance to Clapper Mill will be found on your left hand side indicated by our Country & Waterside Prestige For Sale Board.